Tech Fit For The Showroom, But The Runway Might Have To Wait : All Tech Considered Wearable technology is often said to look dorky. "Stylish" and "fashionable" are not words anyone would associate with devices like Google Glass or smart watches. But companies are now working to embed technology into clothing so that it's unobtrusive or even attractive. The Navigate Jacket from Wearable Experiments uses GPS navigation and a mapping app on the wearer's smartphone to signal directions. It's part of a new trend of wearable tech that some speculate will be a billion-dollar industry. The human body is a limited piece of real estate. For years, tech companies raced to make the smartphone a beautiful device with soft curves and bright screens. Now, the industry is racing to make clothes that free up your hands from the phone while still connecting you to streams of digital information. Wearable technology is one of the trends at this year's International Consumer Electronics Show in Las Vegas, and Billie Whitehouse, founder of Wearable Experiments, says her smart jacket with GPS navigation belongs on every woman's shoulders. The Navigate Jacket integrates with the mapping app on your phone. Type in a destination and little vibrators built into the shoulder pads tap you on the left to turn left, on the right to turn right, and double tap when you've arrived. 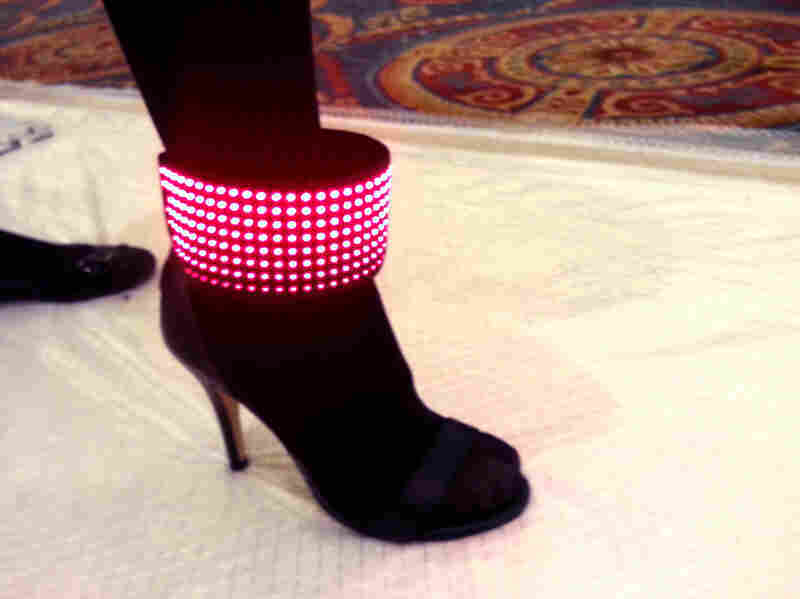 This black high-heeled shoe from Erogear has an LED band that can broadcast low-resolution images or even a Twitter feed. "We're basically trying to give the customer their eyes back," Whitehouse says. "So when you're wandering around a city — say you've never been to New York before — you don't have to stare down at your phone the entire time." A company that makes smart watches is showcasing a sleek new metallic band. It's called the Pebble Steel, and while it is slimmer than the firm's original plastic watch, the big face still hangs off my wrist. Spokeswoman Myriam Joire says that's a small price to pay for all the functionality in the mini computer. "When you're outside your car, it shows you things like your tire pressure [and] where did you leave your car," Joire says. "If you're parked in a parking lot, [it] makes it easier to find." A lot of women don't like watches, so Michael Lee of Erogear shows me a black high heel shoe. It has LED lights built into a wide ankle strap, making it a low-resolution screen that lights up, say in a dark club. "Just like a Jumbotron, and it can also stream live Twitter feeds," Lee says. "Within two or three seconds of you uploading to your Twitter, it will actually show, after a profanity filter, obviously." Many experts at CES are saying wearable devices will explode in 2014. Suddenly, we will all want smart-gadget gear that augments our body parts with data streams. It's a bold vision with a nice dollar figure attached. At a briefing, Consumer Electronics Association senior researcher Kevin Tillman dropped the B-word. "For wearables we see a 35 percent increase in year-over-year growth from 2012 to 2013, up to $1.2 billion in 2014," Tillman said. But the "Year of Wearables" may be many years away. I emailed a picture of the black high heel that streams Twitter to Eva Chen, the editor-in-chief of Lucky Magazine in New York, who goes to fashion shows, not electronics shows. "Wow, that is something else," Chen says. "You know it's definitely a fashion statement, I would say that much." Chen self-identifies as a tech enthusiast in fashion, she's even tried on Google Glass eyewear. But, Chen says, most shoppers don't look for smart. They look for style. "At the end of the day, the fashion industry is a very image-driven industry and it has to look right," she says. "And it has to be ultimately what someone wants to wear; because if people don't want to wear it, then it's not going to sell." Apple recently recruited a top executive from luxury brand Burberry, and Intel is partnering with Barneys New York to create a new wearables product line. Chen says maybe the fashion leaders can get tech on to more bodies.